If you knew me in person, you'd get from first glance that I don't run. In fact, I hardly do much workouts, and I don't have any gym membership anywhere. The last time I ran was last year, at a Men's Health Miracle Run, and before that was a month-long class in Muay Thai Kickboxing back in '06. All the other days, sports were the last thing on my mind. J, Me, Tubbs and C at The Fort. If you were wondering, I didn't finish the 10K. more to just walk. Ha! However, when things I least like pave a way for me to learn [or at least learn to like] things, especially for a cause, I let go of inhibitions and my pride and my vanities of being afraid to look stupid. 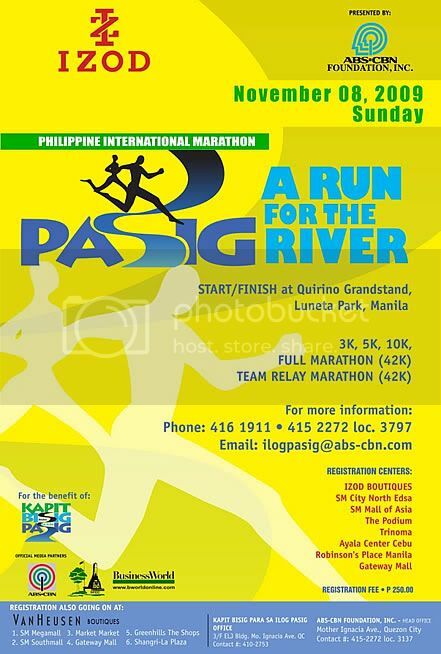 Thus I am joining the Philippine International Marathon: Run for Pasig River, happening on November 8, 2009. Especially since the company I work for has committed to helping out ABS-CBN Foundation in rehabilitating Pasig River, it is only imperative that we help out, in whatever way we can. Besides, I can fake attempting to be healthy, too! Are you fond of running? If yes, will you be joining this run? I'm not but I'm fond of helping out a cause!